If you’re a regular reader at The Greenest Dollar, then you know I’ve now written several articles on different alternatives us girls can turn to in order to have a greener period. I first wrote an in-depth article, “This One’s For The Girls: Green Your Period”. And then a few months ago, I did a product review on the Diva Cup, and loved it. And, I’m just as excited to offer up this product review on Lunapads, reusable menstrual pads. The best news? Lunapads has generously offered a coupon for us. Yay them! So keep reading! Lunapads was first created by Madeleine Shaw in 1993. Like all of us, she was dissatisfied with commercial disposal menstrual products. So, she decided to start making her own. I tried two different Lunapads products. The first was the small pantyliner, which is the picture at the top of this post. The second product was the Lunapad Maxi Pad, with one regular liner and an extra wing liner, shown on right. After using my Lunapads for one full cycle, I’m happy to report that I was really impressed with how well they did. Yep, not once. I was really impressed with that because I thought for sure, being cotton, that they might not hold up. The wings especially did a great job keeping things nice and neat, and even on my heaviest day there were no issues to speak of. Lunapads are made from really, really soft cotton. It almost feels like fleece. This is a drastic improvement over the uncomfortable “diaper feeling” of traditional store bought pads. Lunapads feel like they’re just part of your underwear, only cozier. I thought that after one cycle of using my Lunapads they might look, well, stained. But they cleaned easily. I threw them in the laundry with my regular clothes and everything came out just fine. Over time I would imagine they might need soaking to keep them completely stain-free, and I know many women do soak each liner as soon as they’re done using it. But for the first cycle mine cleaned up great. If you already use Lunapads, do you soak yours? If so, does it work? I’d love to know how to keep mine clean for the long term. The cool thing about Lunapads is that they’re designed to be changed easily. For instance, you wear a base pad, which is the pad on the left in the above picture. You then use liners, shown on the right in the above picture, to handle your flow. When you’re ready, you simply change the liner and leave the base pad in place. It’s really easy. Like the Diva Cup, Lunapads eliminates all waste from our monthly cycles. You wash and reuse everything, which is awesome! Using traditional pads and tampons means that you have to keep buying them every single month. And, this is an endless drain of money. But, investing in reusable menstrual pads like Lunapads means that you don’t have to keep spending money each month. Once the investment is made, that’s it. I can’t imagine how long each Lunapad lasts. But I can tell you that I looked at the stitching closely, and they’re extremely well made. They’ll hold up in the washing machine a good long time before they start to fall apart. If you’ve been using Lunapads for a while, I’d love to hear how long yours has lasted for! Well obviously, any woman can use Lunapads. They make an amazingly wide variety of pads, so whether you have a light flow or a heavy flow, Lunapads makes a pad to handle it. I think Lunapads would work especially well for younger girls who want to eliminate waste from their period, but aren’t yet old enough, or experienced enough, to handle a Diva Cup. The only concern I have with younger girls using Lunapads is the logistics. For instance, I can remember all too well have very embarrassing it was to have a period in middle school. It definitely would have been an “adjustment” for me to handle changing, and storing, a reusable liner during the school day. I definitely think most younger girls today are sophisticated enough to handle Lunapads. 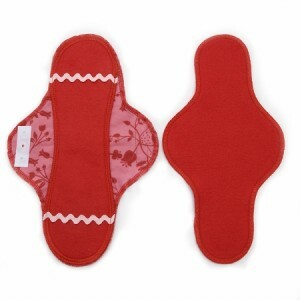 And with the advent of the green movement, I definitely think many of them might want to use a reusable pads. But I do think that they should be given a strategy, and a discreet bag, for storing their Lunapads in their backpack during the school day. Ok, I love the Lunapads products. But that’s not the only reason why I love this company. I love this company because they’re making a real effort to get reusable menstrual pads to girls in Africa, so they can attend school. The problem over there is that many girls, especially in the rural areas, don’t have access to menstrual care products. So when they get their period each month, it means they can’t go to school. That’s one week lost out of every month. So these girls fall further and further behind the boys. Many don’t even finish school. If you’d like more information on donating reusable pads for girls, click here. And if you’re a sewer and would like to help sew reusable pads for donation, there are instructions at that link to show you how to do it. It’s safe to say that because of these efforts, this company has won my heart. Want to try Lunapads for yourself? The company is offering all readers a 10% off coupon for all orders over $35. Just enter the code “greenestdollar” at check out. I have nothing bad to say about my Lunapads. I was really impressed with how well they worked, and I think they are an excellent alternative to traditional pads and tampons. They were comfortable, easy to use, and a great way to save money over the long term. Plus, they’re a company trying to make a real difference in the world by donating reusable pads to girls in Africa. They get my enthusiastic recommendation! The past two articles I’ve written on women-specific issues garnered several complaints, some nasty, from men. These men felt that I was “grossly over the line” in covering the taboo topic of menstruation. They felt the articles were disgusting, that I was lowering the tone of The Greenest Dollar, and that I would lose readers by the droves for covering these topics. And, that is putting some of their comments nicely. So if you’re grossed out by this topic, listen up: These articles help women. And I’m going to keep writing them when I feel like I need to. I didn’t get one complaint from any woman for covering these topics. In fact, I got dozens of “thank yous”. If you have issues with this article, please leave a public comment for discussion. I will not be replying to any more nasty emails and name calling; if you have something to say, do it openly. And for all the women that sent in words of thanks and support for the last two articles (“This One’s For The Girls: Green Your Period” and “Diva Cup Product Review“), my heartfelt thanks. You rock! It’s good to hear an opinion of this thing. I’ve seen them at the health food stores and wondered if anybody actually used them. It’s a newer concept for me and I appreciate your review! First, thank you for providing this information. I’ve seen the Lunapads elsewhere and have also been curious how well they work. I’m definitely going to try them. Two, I’m appalled that men have had the nerve to send nasty e-mails. It’s quite clear from the beginning of your articles what the topic will be. If men don’t want to read about menstrual cycles, which I completely understand, then skip those articles. Unfortunately, menstruation results in a lot of environmental waste and I appreciate hearing about ways to reduce this waste. I would like to think that anyone interested who is environmentally conscious would also appreciate your efforts. All women menstruate – deal with it! If we didn’t, these boorish men wouldn’t be around so they should think about that. Ha – one of my security words below is boorish. That can’t be coincidental. Honestly, the plastic snaps on my lunapads started to vanish (fall off, get lost, etc) after about 3 years – adding a bit of velcro in place of snaps has worked nicely though. Otherwise, no issues. I soak mine at the end of each day and still end up with a bit of staining, but it’s not too bad. Kudos for addressing an issue that is quite relevant to a huge chunk of the population! Not all green things are universal, but this is probably as close as it gets to taking care of 1/2 the human population’s foot print! I have been using cloth pads for a long time. I get them from a great work at home, homeschooling mom. She sews them herself. I love them. We need articles like this as woman may not know such things exist. I have a heavy flow and these cloth pads still work from me. I buy long ones with wings. I throw my pads in a bucket in the shower that has some water in it (it drips from my faucets.) Then every few days I wash with my towels. I hang outside or inside to dry. They last longer that way. I spent about $300 on a full set for me, as well as two of my friends. These will last 3-5 years. All three of us would have spent over $300 in just 1 year of disposable pads. Plus we are keeping disposables out of the landfill. Total savings about $600 or more over 3-5 years. Great topic! I might try them, but I am very used to the “traditional” (disposable) methods of dealing with my cycle, and this may take some getting used to. And if they stain a little, so what? Who are you showing them off to? This seems like a great idea, and the benefits to other women in Africa just makes it great. And if any men have problems with these types of articles, DON’T read them! How childish to make nasty comments. Wow, thanks to all of you for writing in! I’ve never gotten so many replies so fast. I’m definitely behind responding now! 🙂 You all rock. @Kristen: So many women don’t know they have other options other than Tampax and Kotex. It’s really sad, and I’m hoping that these reviews get spread just so that women are aware that they have safer, greener alternatives. It’d be great if products like Lunapads and the Diva Cup were carried by bigger retailers like Target. @Allison: I know…menstruation is just part of life, no big deal. But some of these male readers were really offended that I even brought it up. I asked one reader if he knew the tampons his wife or girlfriend or sister were using weren’t safe, wouldn’t he want to know about safer alternatives they could use to stay healthy? @Heidi: thanks for the great tip to handle the snaps when/if they fall off. I wouldn’t have thought of Velcro, but that’s really clever! @Jennifer: Good luck if you end up making your own! I’d love to hear your progress if you get started. @Rebecca: thanks for the rundown on how much you’re saving! I know some people might get sticker shock when they see a full set is $150 (for the organic cotton ones) but they’re truly worth the money. And like you said, they last a good long time, so you’re definitely saving over the long run. @Melissa: I think over time they’ll definitely get stained. Seems like it’d be impossible to avoid it. But like you said; who are you going to show them to? And it’s definitely an adjustment. Just give yourself time to get used to the idea. When I ordered my Diva Cup it took me two months to work up the nerve to actually use it! But when I did, I LOVED IT. And these Lunapads are the same; they’re so comfortable, and you’ll definitely experience your cycle in a new way. But, only do it when you feel ready and the process will go much smoother. I have made my own cloth pads. They are fun to use because they are bright colors. The only problem I’ve had is staining, which I use hydrogen peroxide and they are fine. I do love my Keeper though the best!! I think that it is awesome you write about these things! I wish people were more open minded about the “weird” things about green living! Thanks for posting this. These will be perfect for my daughter. Im still collecting up some for her. one more thing, there was a comment to stick with the traditional route of disposables. But really the traditional route is cloth. Woman have used rags, cloth, etc for hundreds of years. Disposables have only been around about 40 years. I challenge each woman to try cloth for one month. Even just buy enough pads for 1 day to see if you could do all cloth. Lunapads may be great, but there are cheaper pads out there, or make your own. Etsy and ebay have lots of work at home moms that make pads to sell. Just look at your disposable pad, measure it and buy a cloth that is very simliar in size (i.e. if you use wings, buy a pad with wings.) When I decided to try cloth I bought one or two pads from many different people to see what I liked. Again thanks for bringing cloth pads to light. I have posted about them on my blog as well. Three of my friends have converteed and love it now as well. And one of those woman plans to introduce them to her daughter when she does get her period. It just makes sense for your skin, your wallet, and the environment. By the way I have vactioned and gone out with my cloth pads. I have a wet bag that has two sides. It is a waterproof zippered bag. It is small. I keep two clean pads in one side, and two dirty ones can fit in other side. When I get home I just throw in my soaking bin that I keep in my shower. On vacation for four days I just threw pads in a bag, did not even wet them, and when I got home washed as usual adding a bit peroxide, and I had no stains. In public restrooms we have our purses anyway, I keep my wet bag in there. Cloth pads are quieter to change then opening a platic pad anyway. It really is not hard and really no less convenient than carrying plastic protection. I just keep some cloth pads in may car in case I get my period off guard. I bought my kiddo a whole set of cloth ones at Etsy and the gal also made me a zippered wet bag. It was pretty great, I ordered the grab bag and just mentioned my daughters favorite colors and stuff she was into and the lady made them all custom for us with the stuff she had. It was EXCELLENT!!!!!!!! To the Melissa who just posted before I did: Thanks for the post: I didn’t know about Etsy, so I just looked it up and I see the set that you bought. It seems like something to try, but I’ll have to save up a bit for the whole set. Do they include the wet bag, or is that a separate item? Anyway, thanks again! I ordered that separately. I emailed her privately and she made me one and sent me pix to make sure I like it. My kiddo thought it was really cool so I got it for her. I used crea8tivemama. It was $32 for 8 pads which was a really great price. I just went onto her etsy site and she has the bags for $8. http://www.etsy.com/shop.php?user_id=55632 You can find her here. Melissa: Thanks for the link! You rock! I have used lunapads and they leaked like crazy. I just threw a whole bunch of them away. So depending on your flow this may or may not work for you. @Rebecca, thanks so much for sharing your logistics of using cloth pads when you’re on the road. The wet bag sounds like a great idea! And, so does using peroxide to prevent staining. @Melissa, thanks for posting that Etsy link. It’s great to support small home based businesses as well as a company like Lunapads, who are doing good in the world. Both have their perks! The cool thing about Etsy is the price. But I checked out that link, and while her designs look great, I couldn’t tell if hers had a removable liner like the Lunapads do? @Anu- That’s too bad that your cloth pad experience didn’t go so well. It’s like that with the Diva Cup as well; some people have great success, others don’t. Have you thought about using the Diva Cup? Great posting, Heather! I’ve tried using disposables before but it didn’t work for me. The cloth would bunch up and the material was so thick. Plus I am a very busy, travelling woman and found them hard to keep clean and inconspicuous. I came to prefer the convenience of 7th Generation disposables due to this, unfortunately. Perhaps when my life slows down I’ll give this a shot once more. Thank you for your informative review! Thanks so much for reading! I’m so sorry that code isn’t working. I’m emailing Lunapads right now to check on that. I’ll keep you updated! Hopefully they can get it fixed by tomorrow. Thanks so much for letting me know! I have been browsing the web since purchasing the lunapads starter kit yesterday looking for tips on maintaining them etc. I was enjoying my research until I read about those spineless Neanderthals sending you emails about writing about something that is a monthly reality for most women. I am actually incensed. Since my first period I have struggled with the secrecy surrounding menstruation, as if it is some filthy disease. We consider ourselves so enlightened in the 21st century, yet we still struggle to accept such basic aspects of life. I have always been a bit gung-ho on discussing monthlies with my male friends, (mainly so that I could warn them to stay at a safe distance) but once it is less of a scary mystery they are quite happy to listen and even ask questions! There should be more articles like this, not less. I’m not saying rub it in peoples’ faces; I can understand that it may make certain individuals uncomfortable. But you have mouses people! You found your way here, if you don’t like it, find your way out! Just wanted to let you know that the coupon code is now up and running! Lunapads finally got back with me and said it wasn’t set up right. So sorry if you tried to use it and it didn’t work! Hope these help someone make the choice to switch to a greener period! if men dont want to read about women’s menstruation than they dont have to keep reading it, if you dont want to read further, than dont…. not hard… My husband is very gland to hear me telling him about the money that i can save by buying reusable products, and that it is much better for me and the planet, i plan on purchasing the diva cup and lunapads, and having the instead cups for a back up. As a new nurse (who generally have 12 hr shifts) I know that bathroom breaks are difficult. Having the time to change pads/tampons is even harder, nurses especially have a very high rate of urinary infections due to not having enough bathroom/break time. This is why i also will tell my sister about these products (she is also in nursing) so she can also be more relaxed at work, and not worry about soaking through scrubs (which are so much easier to soak through than jean). I saw a menstrual cup at Wal-Mart and decided to look into them online. It looks like your hope for larger retailers to carry such options is a reality. Thank you for sharing your experience. I’m not so intemidated by the cup now. Hi! I just stumbled upon your site today but let me express my thanks at your no nonsense explanations! I just need somebody to tell me straight what to expect from the products, and you’ve done just that. Thank you!